This entry was posted on March 17, 2013 at 1:47 pm and is filed under Author, KfC's 2013 project, Richler, Mordecai (4). You can follow any responses to this entry through the RSS 2.0 feed. You can skip to the end and leave a response. Pinging is currently not allowed. Richler had no time at all for the Quebec separatists and their “independence” movement. The fact that he chose to write about it in American publications (like the New Yorker) made him even more of a target. His “personality” certainly had an impact (positive) on his readership in English Canada, but my evaluation would be that that political aspect was a relatively minor factor. He was outspoken about a number of other things (including his love of Scotch and the Monte Cristo cigars that figure in a couple of his works and the first edition cover of Barney). And he was very much a “boulevardier” in the Montreal scene. Thanks for the review, Kevin! You did a great job of pulling together the different story lines and highlighting some of the complexity of the book. I’m still not totally sure why but this remains my favorite Richler novel, maybe just because I enjoy both Ephraim and Solomon as characters and I like the mysticism-meets-modern-day aspect of the book. You make a very good point. Unlike Richler’s other novels where the central cast is relatively small, this one offers readers a choice of potential favorites (Moses would be another one). Part of the challenge for me in getting into the rhythm of the novel in its first half came from the continually shifting point of view as he moved from character to character — I didn’t yet have a very good fix on some because there were so many of them. This book is sitting on my shelf waiting for a re-read some time in the next few months. I read it in my late teens and remember it as being very confusing but at the same time compelling. Thank you for this review, and it has pushed this book closer to the top of my TBR stack. I can’t wait to see how it stacks up for me 15 years after my first read. I was surprised at how contemporary many of Richler’s asides and “cheap shots” were — the novel certainly was not dated in any way. And the confusing parts were easier for me to handle this time around, although the early parts still were a bit of a challenge in keeping everyone straight since I had forgotten a number of the major characters and even more of the minor ones. Ok, thanks for the explanation. BTW, my cover of Barbey’s version is a scene from the film. 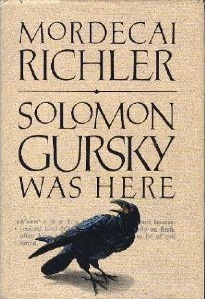 “The jacket promo of my first edition of Solomon Gursky Was Here refers to it as Richler’s “most ambitious and mysterious novel”. I’m not saying that’s ipso facto better; I’m a big fan of well-written history. But I am saying that even when CanLit is ambitious, its tendency — or at least the tendency of those who decide what gets into print — is to ignore and/or squelch work whose ambitions go beyond the intuitively defined “acceptable ambitions” that predominate in the Canadian literary scene. IMHO, we’d have a stronger literature — and more high-profile canon internationally — if we published more long social novels specifically about contemporary life. I am inclined to agree you that length played a part in that copywriter’s description — although I suspect the multiple plot lines were an even greater factor. I’d also say a quick search would lend to support to your point about length in general — a quick scan of Giller winners to date would seem to show that only A Fine Balance would be regarded as a long novel. Having said that, I’m not sure I would agree with the conclusion you draw — although I have to admit I can’t find any ready arguments against it. My god, that cover is lovely. Your review is really intriguing– I loved Richler in high school, but never gave this title a shot. I’m in the mood for some CanCon, so I think I’ll dig up a copy. The raven on the cover does feature as an ongoing omen throughout the book — I didn’t mention that in the review because it simply would have taken too long to explain. If you liked Richler in high school, this one is probably worth trying in adulthood — it will certainly bring back some memories (mainly when he dips his pen into a little playful poison) but also introduce you to a different side of the author.